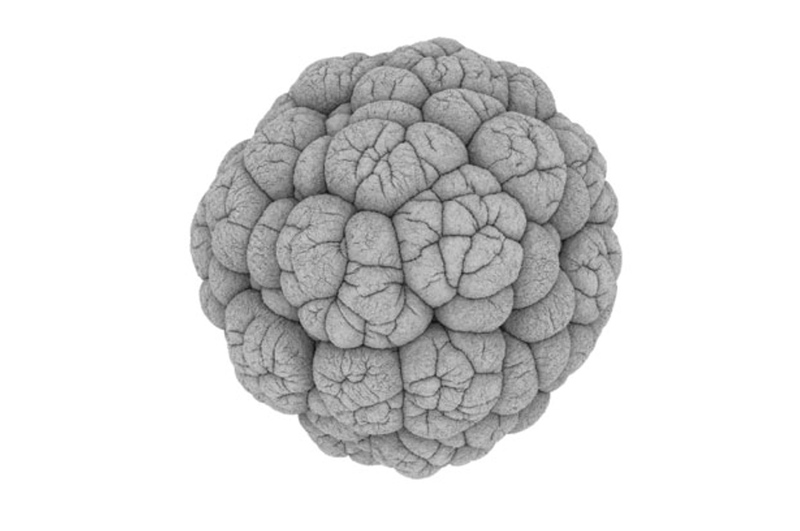 Inspired by the work of Alan Turing, Ernst Haeckel and D’Arcy Wentworth Thompson, Cellular Forms uses a simplified biological model of morphogenesis to explore the generation of complex three dimensional structures. Each form starts with a small initial ball of cells which is incrementally developed over time, adding iterative layers of complexity to the structure. The aim is to create forms emergently from the interactions between individual cells, exploring generic similarities between many different shapes in nature rather than emulating any particular organism. The process reveals universal archetypal forms that can come from growth-like processes rather than top-down externally engineered design. Cell division is controlled by accumulated nutrient levels. When the level in a cell exceeds a given threshold the cell divides, and various parameters control how both the parent and daughter cells re-connect to their immediate neighbours. Rules can also be adjusted for how nutrient is created, such as by being randomly uniformly created by each cell, or by incident light rays creating nutrient in cells hit by photons. Nutrient can also be allowed to flow to adjacent cells. The simulation process is repeated over thousands of iterations and millions of particles, with typical final structures having over fifty million cells. A number of internal forces affect the structures, including linear and torsion springs between connected cells. Additional forces repel cells that are in close proximity but are not directly connected. This creates tensions within the structures that induce them to change shape dynamically, with surfaces naturally folding into complex organic forms. A wide set of variations arise from small changes to the rules governing the systems, with selection of forms based on aesthetic considerations rather than optimizing a conventional fitness function. All resultant motion as well as shape is genuinely emergent, since the simulation rules only dictate interactions between adjacent cells. Two complementary rendering methods are applied to the simulation data to visualize the generated data and reveal different aspects of the forms. The first shows the cells as sphere primitives illuminated with a diffuse light from all directions, revealing the three-dimensional shape of the forms through self-shadowing of the surface. The second uses a density accumulation map, with each cell represented as a sphere of equal density. This digital emulation of an X-Ray reveals internal details of the structures that may not be apparent from the external surface.